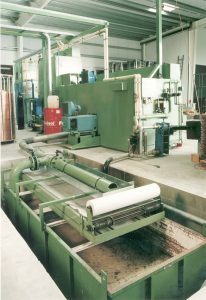 The wire drawing process consists in an elongation of the material (copper wire, aluminum wire, aluminum alloy wire, etc.) 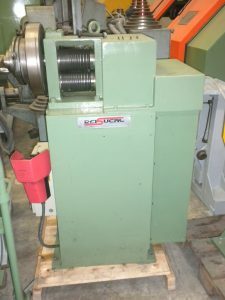 produced mechanically by the pulling of the wire through one or various dies by some drawing capstans in order to reduce its diameter progressively. This transformation is carried out without any loss of material. 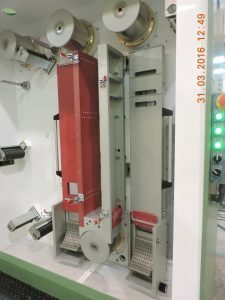 At the end of operation, the exact weight of the material that came into the drawing machine at its inlet will be coming out of it at the outlet. The wire, though, will be longer and its diameter will have been reduced during its transformation. 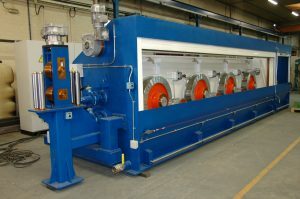 Depending on the material which is drawn and depending on the application after the drawing process, the wire, which has become much harder and brittle during its transformation, might need to be annealed after the drawing operation in order to give it back its basic mechanical properties. Depending on the needs and requirements of our customers, all our drawing lines can be supplied either with DC motors using state-of-the-art drives and components or with the latest technology’s AC motors controlled by frequency variators. Do not hesitate to ask our engineers about your needs and technical requirements! TECALSA can manufacture the machine you dream about! 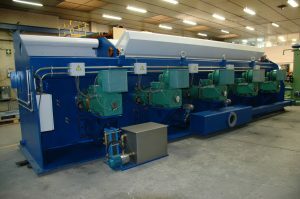 Static coilers with capstans diameters 750 or 1000 mm, rosette layering, basket automatic change, 3 positions, roll conveyor at floor level or underground. High performance, longer lifespan, easy maintenance and low wear and tear thanks to the very low level of vibrations! 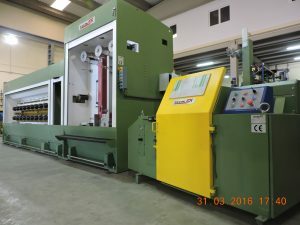 Our intermediate wire drawing lines are mainly designed for copper wire and are the safest bet to insure a high production of intermediate wire in the safest way. Wire dies with pressure chamber. Transmission is generally done via belts for an easier maintenance. Speed up to 40 m/sec. 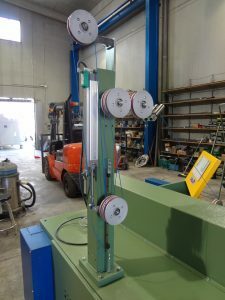 Can be driven either via belts from the drawing machine or with independent motor. 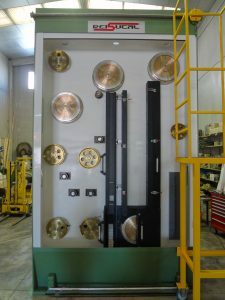 Complete with their transformers whose power will be adapted to the maximum wire outlet diameter required by the customer and equipped with their steam generator, etc. 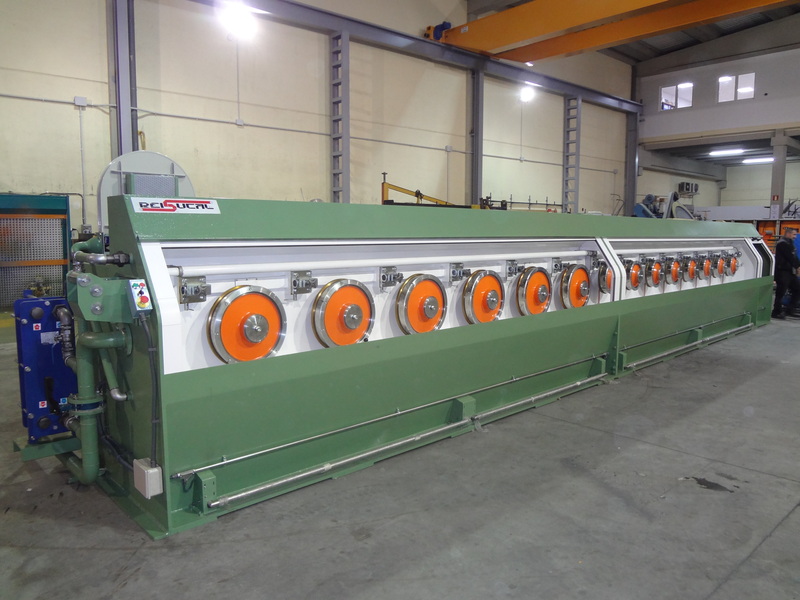 Multiwire drawing machines with their continuous annealers for copper, aluminum and alloy wires. Driven via toothed belts. High performance and easy maintenance. Wire dies with pressure chamber. Speed up to 35 m/sec. Model F20 - for fine multiwire drawing machines which is adapted to the number of wires of the drawing machine. Model F25 - for intermediate multiwire drawing machines which is adapted to the number of wires of the drawing machine. They can be driven either via belts from the drawing machine or optionally with an independent motor. 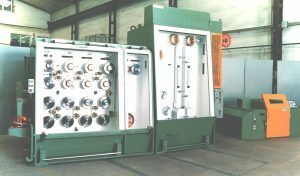 They are supplied complete with their transformers whose power will be adapted to the maximum outlet wire diameter required by the customer and with their steam generator, etc. 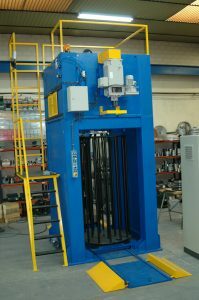 We can also supply all types of pay-offs for our drawing lines, either single or multiple and even flyer type. 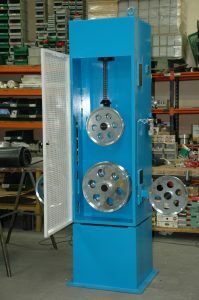 Our wire lubrication cooling plants (for wire emulsion) can be supplied for all our wire drawing machines, either for wire rod breakdown, intermediate or fine multiwire and they can be connected to a filtering system and to a heat exchanger. They can be installed underground (or partially underground) or at floor level with pumps to send the lubricant to the various elements of the line. The tanks capacities can vary according to the needs of the customer, as well as the capacities of the pumps, of the filtering devices and of the heat exchangers.